This card has so many possibilities - whether it be for a birthday card, Valentine's Day card or Thinking About You card. 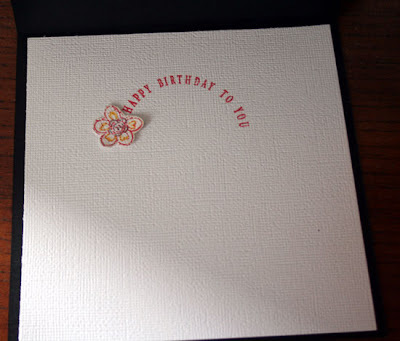 It uses 3 different Justrite Stamp sets - Hamony Classic Circle Set for the butterflies; Stitched With Love for the card's center and the flower on the inside; Celebrations Demi Phrases for the sentiment. I touched up the flowers with Spica pens for a little shimmer and shine. All images were die cut with Spellbinders Nestabilities dies. Ink is Warm Red by Colorbox. The card front was embossed with a Cuttlebug embossing folder. I recently tried out for the Imaginisce DT. Unfortunatley I didn't make the new DT, but I do love this layout of my son, playing his favorite sport. 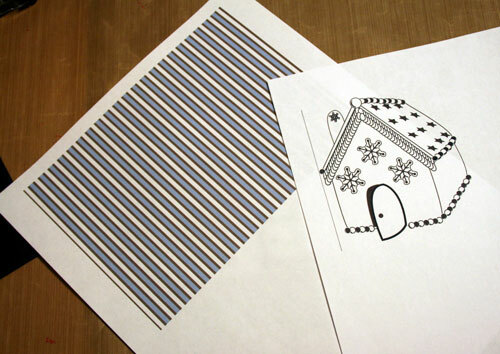 Used lots of Imaginisce pattern papers, and of course, my trusty Cricut Expression and the Sports Mania cartridge. and Happy Holiday to you and yours. Using my beloved Kreaxions punches, I created this Christmas card using punch 907 with insert "B". After stamping my image, I die cut it with Spellbinders, Nestabilities and then I created rectangles to hold my image. Punch 907 was used on the corners. This card uses 907 with the "C" inserts on the corners of the card and the corners of my image. I added some distress ink along the edges before sewing the image to the card. Then punch 915 was used to create the border under the number 25. Today's post at Blackleaf Studios shows how easy it is to create custom cards when using digi images because you can print them in any size you want. Many times, I've stamped an image and really wanted something larger, so I'm finding digis are a big help. 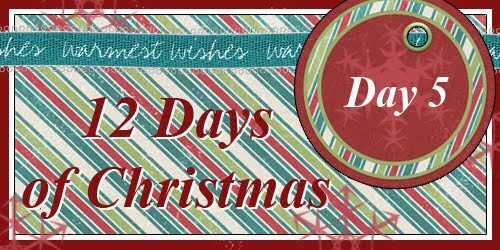 Well, it's just about time for Christmas, and it's time to finish those last minute gifts. And what about the wrapping? The wrapping is just as important as the gift itself. Several months ago, I discoverd Elizabeth O. Dulemba through Justrite Stampers. Elizabeth is a children's book author and illustrator who creates some amazing artwork. If you visit her blog, she allows you to download images she has created. Her artwork is amazing. I decided I wanted to decorate a gift bag so I chose to use Elizabeth's Snowman image, and, of course, I had to use my Copic markers on the Snowman and the background. I created a large snowflake with my Cricut Expression and the Winter Lace cartridge. Laying the snowflake atop the gift bag, I sprayed Tattered Angels Frost Glimmer Mist for a little sparkle. I added it to the gift bag with some Pop Up Glue Dots. I created the snowmound with a fun snow pen from Marvy Uchida. You lay down the ink then heat set it and it puffs up - it's awesome! I then inked the edges of the image with Ranger Distress Ink and mounted the image on some K&Company paper. I used a Silver Spica pen on the snowflakes then added American Crafts Glitter brads to the center of several of the snowflakes. The sentiment was stamped on white cardstock, inked with Ranger Distress ink and mounted on black cardstock. It was then added above the image with black brads. I then used additional Pop Up Glue Dots on the Snowman image to set it apart from the snowflake. Well this is my final post at SugarCreek Hollow and it has been fun. Tracy has some lovely images, so be sure to stop in the store. Also, check out all the fun creations the DT made this week. I used the Believe sentiment with this vintage Santa paper I found. We all love candy and who wouldn't love something different on the Christmas table? I found these cute little paint cans at Michaels and knew they'd come in handy for something!!!! 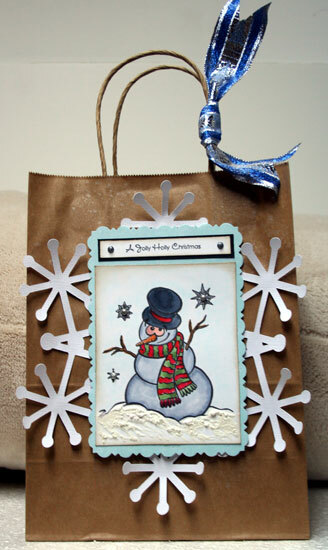 Using Justrite's Holiday Cheer stamp set, I stamped 5 snowflakes for each paint can and one sentiment. 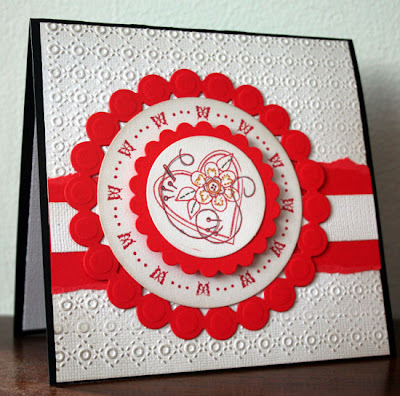 A 1" punch was used for the snowflakes, while a circle Nestability die was used for the sentiment. Using Glue Dots, I adhered the snowflakes around the can and on the lid. Candy kisses were added, but M&Ms would work or any other chocolate of your choice. Some bling helps make the snowflakes stand out. These tags are just a breeze to make with the right tools. 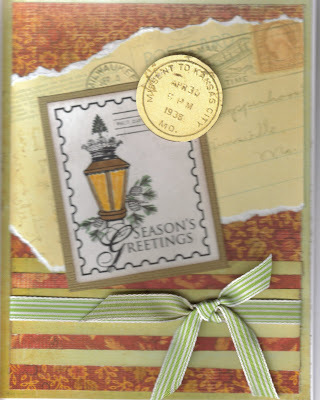 Check out JustImagine's blog and MyStampBOX blog for some more inspiration. Using just a plain shipping tag, I punched the edges with my Kreaxion punches, added die cut circles, then a stamped the snowman from MyStampBOX's Merry Mr. Snowman stamp set. After punching the edges, I lightly inked the edges with Ranger Walnut Ink. Then I mounted the circles which had also been lightly inked. The snowman was the last addition and I added brads for his eyes and buttons. The challenge this week at Sugar Creek Hollow is to create a red and white card. I chose to use the Baby Jesus and scroll images for my card, keeping it simple with torn edges and a small pointsettia. Now head off to the rest of the team's blogs and see what they've done this week. The closer we get to Christmas, the more I realize that I need more cards. I used my favorite products on these cards, MyStampBOX stamps and Kreaxions punches along with some rub-ons I've had in my stash for quite awhile. It was time to break them out and use them. Unfortunately, the smaller images came off the backing in pieces, so I decided to use what I could to create my own patterned paper. Kreaxions punch #907 without the inserts was used across the image. I used Spellbinders Oval Nesties to die cut around the ornament. 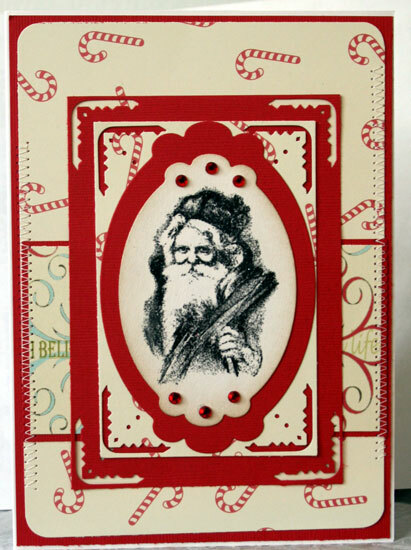 Joyeux Noel is from Merry Mr. Snowman stamp set. Kreaxions punch #918 with insert "B" was used as the base layer on this card. Then I used insert "C" to create the secondary layers. 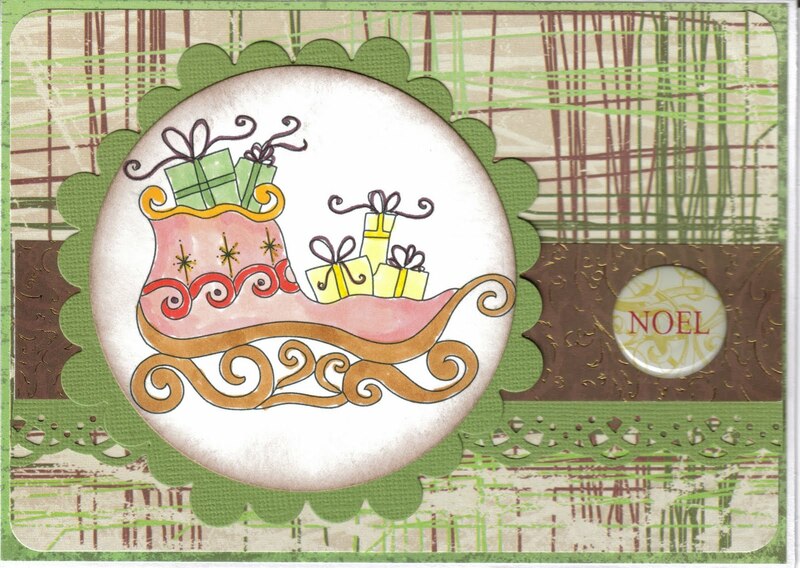 I used Spellbinders Oval Nesties to die cut around the ornament. Well, that's how it's been feeling around here lately. Cold with a chance of snow!! This card is quite appropriate for this weather. 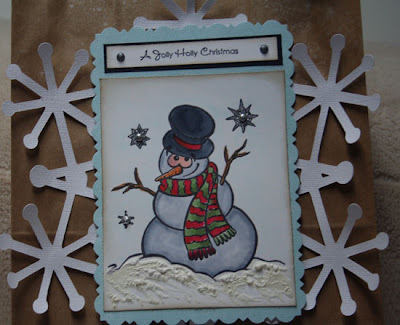 I first embossed the front of my card with the Snowflakes Embossing Folder, then I used Let It Snow Stamp set from MyStampBox stamps, stamping snowflakes on top of the embossed ones. 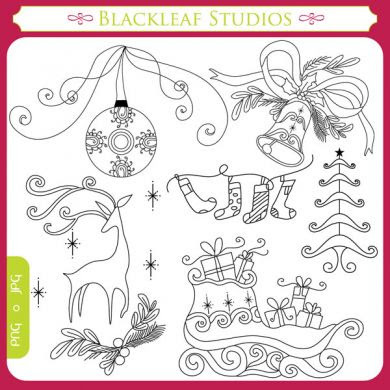 I also added snowflakes to the image once it was die cut into the oval shape. I used the lovely Winter Lace cartridge with my Cricut Expression to create the large snowflake. 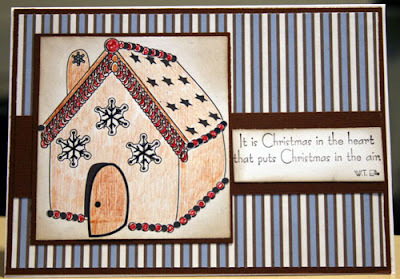 I used the word "Snow" from the Let it Snow phrase, corner rounding the edges and mounting it on blue cardstock. This was then popped on the card front. ... I made Christmas Candy Bags. Well, we know Christmas is not too far away now, so I thought I'd create some candy bags. 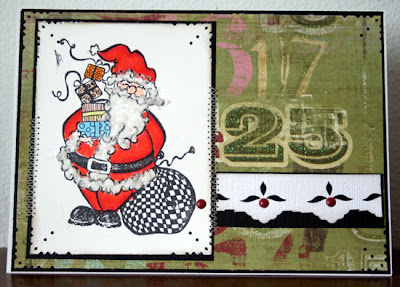 These are quick and easy to make when using myStampBOX stamps. I used "Color Me Sentiments" merry x-mas and stamped it in brown ink on green cardstock. Then I used the gift package from "Merry Mr. Snowman". Since I made a number of these, I colored each one with my Copic markers. These are the completed bags. Why not make a bunch and put them on the table or place them in someone's Christmas stocking. I was able to get 3 Russel Stover Caramels in mine, but they'd easily fill with M&Ms or Kisses or Reeses are anything else you love. 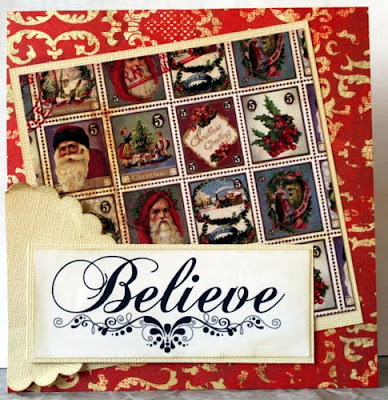 Stop by MyStampBOX and see the awesome work by the team and while there, check out the awesome stamp sets available. Are you looking for a way to create a quick and easy soccer layout? Well, look no further than Scappin Sports Stuff for some amazing papers and embellishments. I loved the look of the Adorn-it Soccer paper, but didn’t want to cover it up. My solution was to cut it apart and use the pieces to create my own background paper. This is a perfect idea when you have lots of photos to use, or perhaps only one piece of that wonderful paper. I chose to use black cardstock as the base of my layout because I knew it would help allow all the elements to stand out. Laying my photos on the cardstock, I then began working with the pattern paper pieces to fill in the “blank” areas, moving around the photos until I loved the design. Once I had the look I wanted, I adhered the photos and then lightly inked the edges of each pattern paper piece I had cut apart. After adhering each piece, I then added some transparent elements on the layout. Today's challenge at Sugarcreek Hollow is another sketch challenge. I chose to use one of the new Christmas images. Set up like a postage stamp, this image has so many possibilities. Wanting to keep the focus on the image, I chose to add just a little color - yellow to simulate the light, plus a little Spica pen for the pine bows. I also lightly inked the ribbon, giving it a more aged appearance. The challenge over at the shabby tea room is to create a shaped card. The sponsor this week is Justrite Stampers. I chose to create a snowflake card that I created with my new Cricut Winter Lace cartridge, then welded it together to create a card with my Gypsy. Of course, I used the snowman from the JRS Holiday Cheer Stamp Set to finish off my card. I added pop dots between the layers for some dimension. It's Freebie Friday over at BlackLeaf Studios and I had the opportunity to create with the heart image today. I know we are so close to Christmas, but this image had me thinking Valentine's Day. Enjoy. I first began by tracing the letters onto my papers and then cutting them out. I sanded the edges once dry, then inked. I used Cricut cuts for most of the elements, tons of rub-ons, and some flowers. Hop on over to the Just Imagine blog and see what everyone has been doing with the wonderful punches from Kreaxions. From simple to elaborate, whatever you want to create you can. These punches are versatile and really fun to work with. I created this card using punch #907 and insert B. It's kinda early here, but I've been in a creating mood this evening. I found some new Christmas papers by K&Co. so I just had to create some new Christmas cards. So unlike me, NOT a Cricut cut on any of these cards, but I did use my Nestabilities.